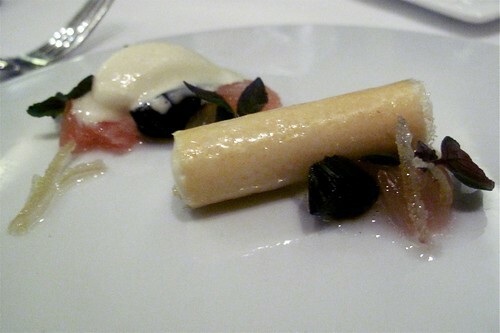 On May 15th, after the last mignardises went out, Sona closed its doors to reopen at a new location sometime next year. There are rumors abound as to the reason for this closing--ranging from the team needing time for some creative researching to severe financial problems in the David Meyers restaurant empire. I suspect it was a combination of things. One thing is clear--Sona went out strong. Sona caught my eye during my early researching of Los Angeles restaurants--before I even started blogging. There is an apparent Japanese influence in the delicate and intricate preparation and presentation of Sona's creations--perhaps a result of Sona's Chef de Cuisine, Kuniko Yagi's Japanese background--that appeals to me. Unfortunately, I never got a chance to visit Sona for their tasting menu. And once they had announced they were closing, I thought it was too late. Therefore, when Tsz of Gastrophoria invited me to do the dessert tasting at Sona with her and some of her friends, I immediately accepted. 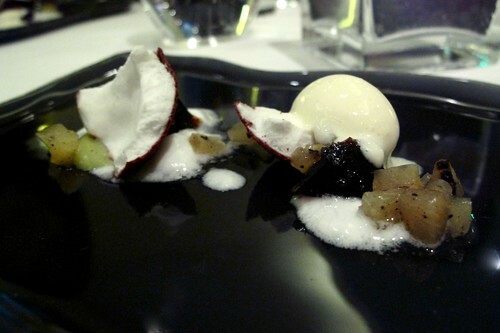 I'd seen pictures of Executive Pastry Chef Ramon Perez's exotic desserts before and could not have been more excited. 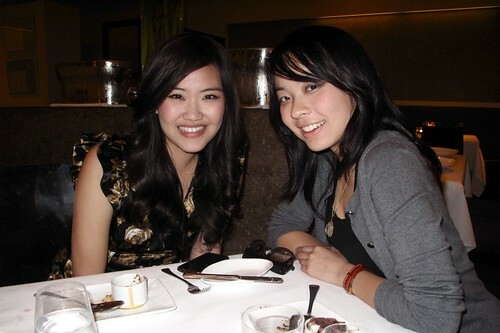 So on Thursday night, we went in for a 3 course dessert tasting priced at a very reasonable $30. 4 hours later, we ended up with an amazing, yet ridiculous, 12 courses of dessert--not including madeleines and mignardises! I'm convinced that Tsz's presence--she staged at Sona during the summer--had something to do with the seemingly never-ending flow of desserts, but Tsz told me that Ramon is just generous to a fault. Plate after plate of desserts kept coming out of the kitchen. Just when we thought we were almost done, Ramon would whip up another plate of sugary art. He must've been doing magic back there in the kitchen. There was no menu printed so some of these names I made up/jotted down on my iPhone when the server described them. My dining companions helped a lot with remembering what some of the components were. Some names I found on kevinEats--he had received a printed dessert tasting menu when he went. On a side note, I haven't been this frustrated with lighting since dining at XIV--clear pictures were nearly impossible. Or maybe I'm just not skilled enough. All I know is, the whole night I had to debate between attempting to take another picture of a plate, or just digging in. So this was the best I could do--they can't even begin to do Ramon's beautiful creations justice. This spherification had a thicker skin than others I've had before, but the combination of flavors was very pleasant and light on the palate. 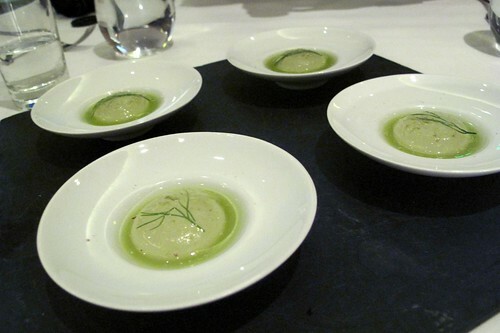 The cool, crisp, flavors of the cucumber soup, sweetened by apple juice, was very enjoyable with the flavors of fennel, anise, and licorice (all similar flavors) in the aftertaste of the spherification. The spongey mint cloud literally melted in my mouth. It tasted of freshly picked mint, not mint extract. The little tapioca balls were interesting in texture, but didn't provide much in flavor. The powder on the plate had us stumped. Was it dehydrated milk? malt? When we visited the kitchen after the tasting, Ramon told us it was yogurt! The frozen coconut milk looked like coconut meat while the edible chocolate shell created a very convincing imitation of a coconut's actual shell. Visually, it was stunning and whimsical. 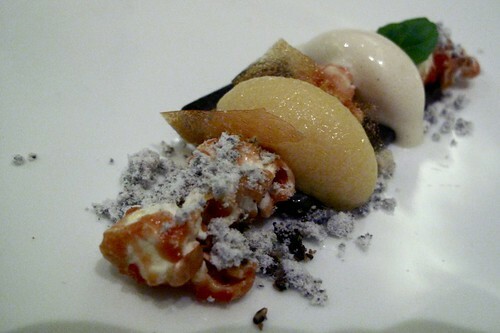 Taste-wise, I thought most of the flavor came from the acidity of the charred pineapple and yuzu ice cream. I love yuzu and this ice cream was deliciously refreshing. This was my absolute favorite of the night. It was the perfect combination and balance of textures and flavors. 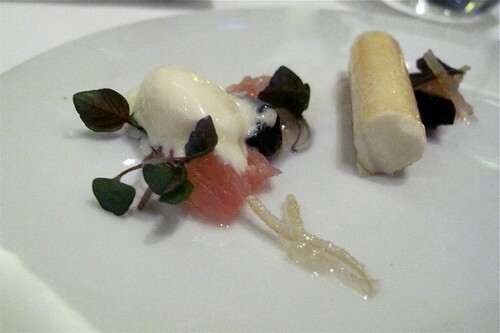 The lemon crème was just acidic enough to pack a punch to the palate, while creamy enough to temper the attack. The sweet, crunchy orange "paper" provided a much needed contrast in texture. I love anything encased in candied sugar. 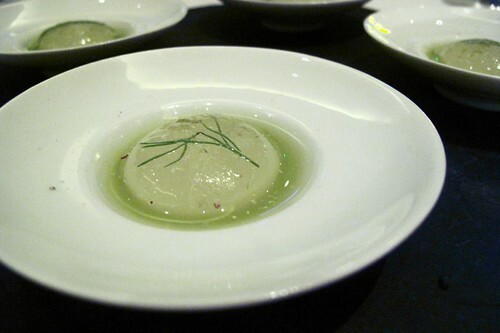 The muscovado gelée reminded us of boba and the tiny pomelo segments provided a burst of freshness. I also detected some candied pomelo peel or ginger but I'm not sure. Last but not least, the ginger ice cream was my favorite ice cream of the night. It had the unmistakable heat of ginger that warmed the back of my throat. Amazing. Ironically, and appropriately, we had some sea salt dusted butter with bread instead of a traditional sorbet, etc. as a palate cleanser. This interlude of saltiness and carb loaded substance was much needed during our sugary marathon. 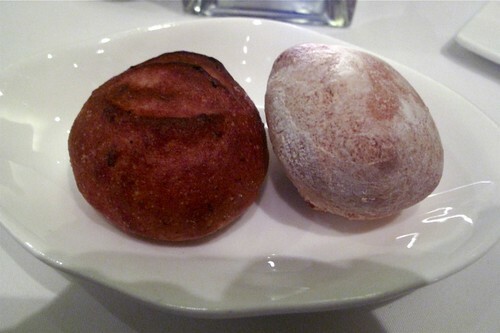 Tsz kept talking about a black tea bread that was divine but sadly, they didn't have any left. Now I'l never know what that bread tastes like. This combination of flavors was one of the only ones that didn't really work for me. The rhubarb chip was sticky, not crunchy like I was expecting it to be. 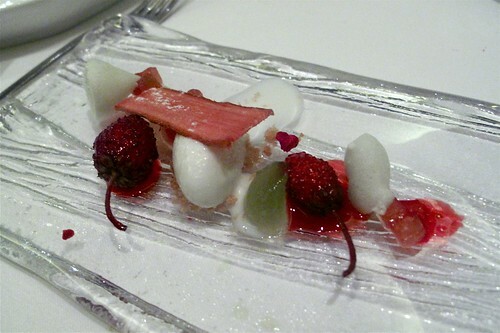 The alpine strawberries were good though--sweet and jam-like. 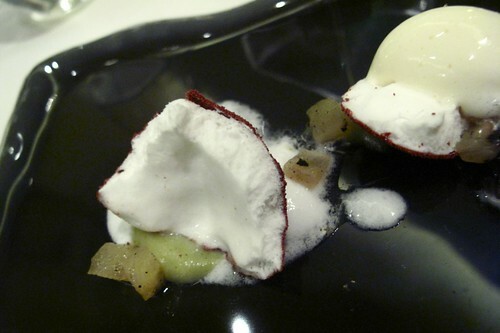 While the meringue was more sponge-like than crunchy and airy, it did give off a strong taste of celery that wasn't at all weird or unpleasant. The Parmesan ice cream wasn't as strongly cheesy as I was expecting it to be. Separately, the components were interesting but together, I was a little lost on how they were supposed to work together. I loved the colors--it reminded me of Christmas :) The frozen raspberry tasted just like a frozen fruit bar and it encapsulated a boozy marshmallow liquor that was stronger than I was expecting. 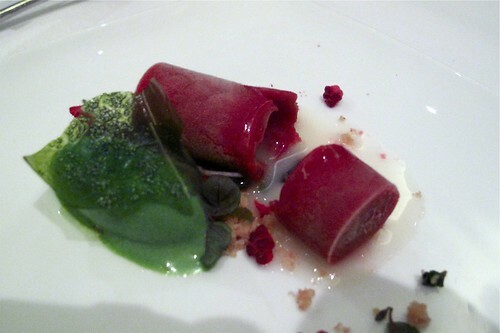 The shiso ice cream was a little too intensely bitter when combined with the also strong liquor. Very beautiful, but a little too strong on the flavors for me. I love anything black sesame and I love anything passion fruit so this was the perfect combination for me--and it worked! 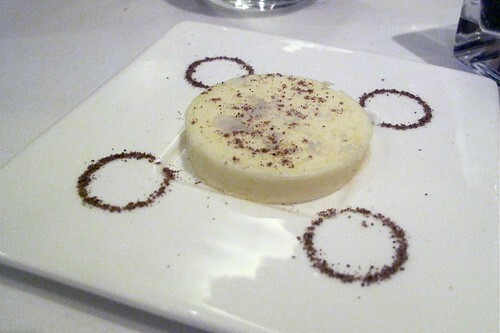 The black sesame crème reminded me of black sesame soup you can get from Chinese restaurants--texture and flavor wise. I love passionfruit and enjoyed the sorbet very much--surprisingly the acidity of the passionfruit actually worked with the creamy sesame. The popcorn ice cream was also great...caramel popcorn not so much--not crunchy enough and it stuck to my teeth. I included that last picture because I wanted to show how most of the desserts were plated--on a large white plates with lots of empty space. 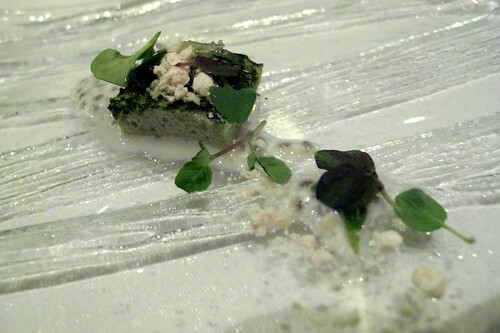 Each course was seriously like a work of art. I think we found toffee bits in this one, but I'm not sure. 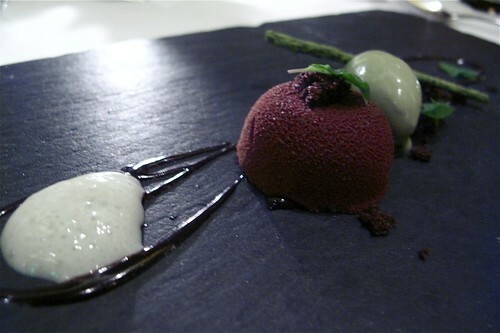 I remember the beet sponge being slightly savory while having a sweet syrupy texture. 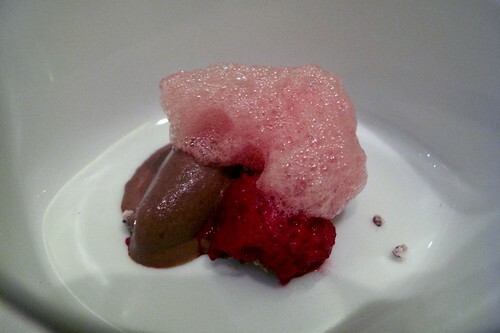 I don't even remember if I tasted the raspberry foam. 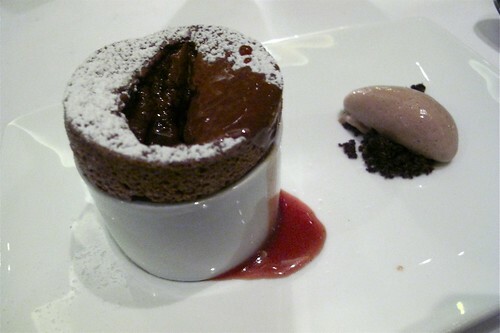 Was it chocolate mousse or chocolate ice cream? Fail. Which course number is this now? Now, this one I remember. I was so excited about jasmine foam, but it was not as strong as I was hoping. 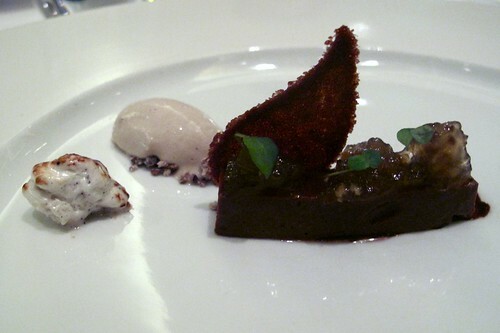 The hazelnut streusel provided an interesting salty counterpoint to the milk chocolate mousse. 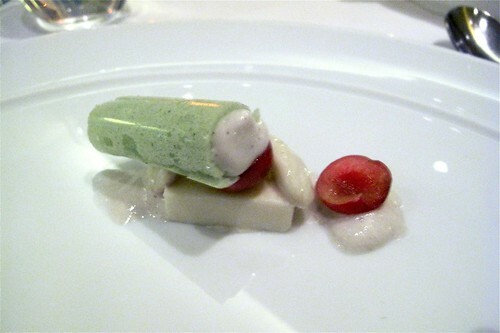 The yuzu gelee hidden inside the little bon bon-like mousse was also a great surprise. The matcha ice cream was true to matcha flavor--not overly sweet like most green tea ice creams. I had been looking forward to the chocolate desserts all night long and none of them disappointed. This one was also a favorite. 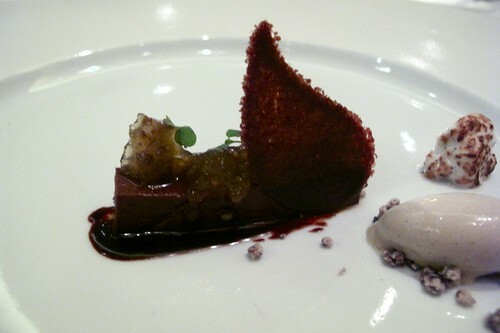 The soft chocolate was deliciously creamy with an eggplant marmalade that almost had a pâté de fruit kind of texture--slightly tart and sweet with a distinct flavor that actually paired so well with the chocolate. I also enjoyed the cocoa nib ice cream on top of actual crunchy nibs. The cardamon marshmallow so intensely cardamon I could still taste it after I finished the dessert. This final course really put us over the top. I was on more than a sugar high. We all joked that we were starting to feel a little diabetic. The server informed us that Ramon only makes this dessert for special occasions--birthdays, etc. Tsz's Sona kitchen knowledge informed me that a truffle in actually placed at the bottom of the ramkein before being topped with souffle batter and baked. 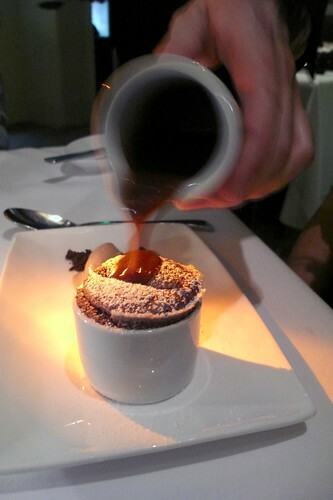 Once baked, the truffle melts and adds another layer of liquid chocolate richness to the soufflé. 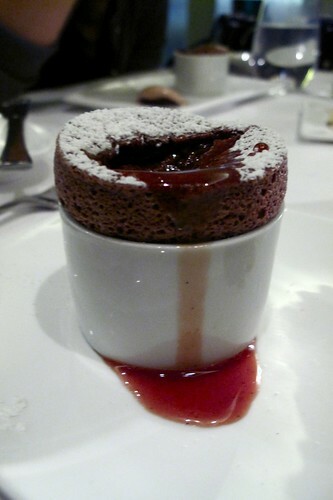 And we're still not done--a long table-side pour of vanilla bean caramel sauce finished off the teacup-sized soufflé. This is definition of decadence. 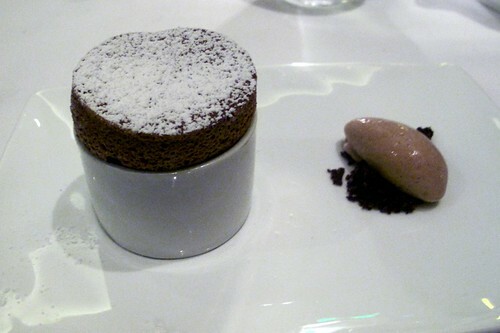 Without a doubt, the BEST chocolate soufflé I've ever had. 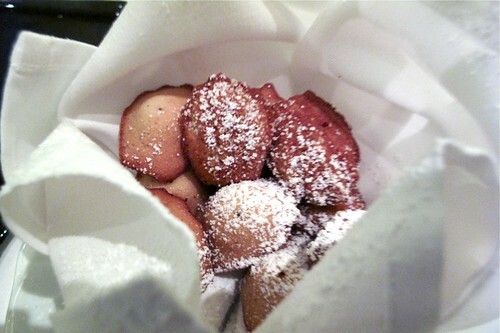 Then along came some warm, miniature madeleines. Who could resist? Obviously not me. I was already ridiculously full from the soufflé but I think I still down at least five of there. There were also some of the best madeleines I've ever had. However, I didn't really get any kind of sencha flavor--just delicious butteriness. 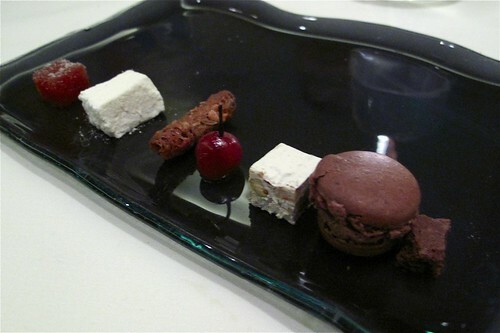 The plate of little mignardises was seriously like a collection of my favorite sweets and flavors. 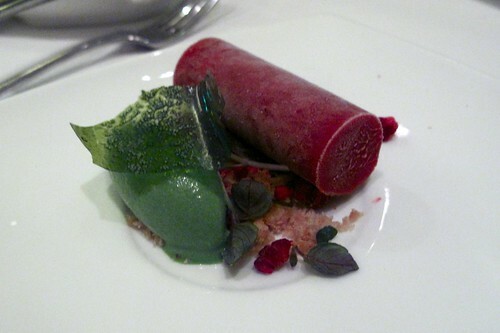 I loved the strawberry-guava flavor combination in the pâté de fruits. I love marshmallows, although this one was a little too tough and chewy instead of light and airy. I love nougat--I've even attempted to make my own--and obviously I have a serious macaron obsession. I have to say though, not to brag or anything but, Sona's chocolate macarons actually tasted very much like my own :) perhaps it's because we both use the same Valhrona chocolate in the ganache. Our sugary indulgence ended past midnight. A trip to the kitchen was the perfect ending to the sweet, fantastical night. Every course was a work of art. Every quenelle of ice cream made me want to scream in delight. Every thing was perfectly sweet. After 12 courses of Pastry Chef Ramon's creations, I've come to the conclusion that his greatest achievement in each plate was that every ingredient was true to its flavor. Simply magical. Not going to even bother reading (sorry C) since this joint is as good as closed. The Q: where's Ramon going? 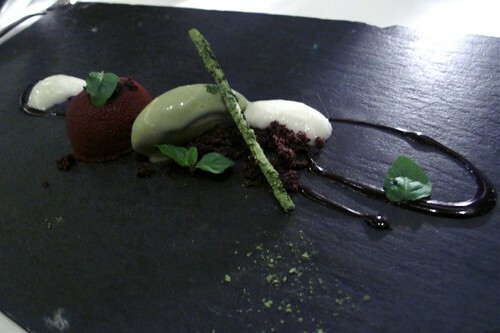 And have you tried Bistro LQ's dessert tasting? 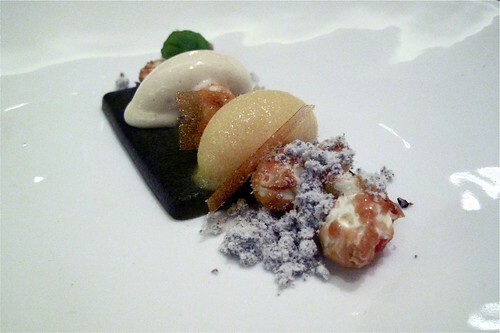 Or Providence's dessert tasting? If so, how does it compare? i'll just be reliving through everyone's posts! @nelehelen thanks :) can't wait for hatchi! I think Ramon said he's going to be at Pizzeria Ortica for a while. 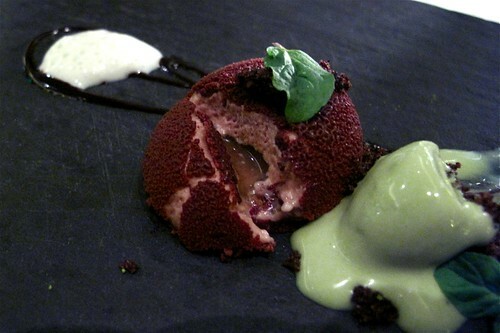 I haven't tried Bistro LQ or Providence's dessert tastings. I think I'm going to make a visit to Providence sometime in June though. Pics turned out surprisingly well. We had to really press them for a printed menu actually, and even then, it contained a number of mistakes (several courses were completely botched, so I had to go off my notes). The dessert tasting looks great! 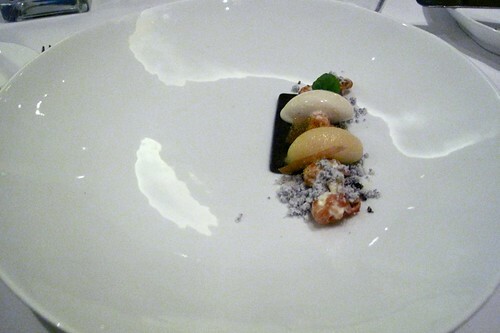 I wonder how it compares to Providence's dessert tasting. I plan on hitting up Providence for the 5 course anniversary special, but I want to try the dessert tasting there for a 2nd time! Traveling the world and documenting my gastronomic experiences--from Taipei to Paris to UCLA dining halls--because I am a lover of food. i'm hungry and proud of it.